Designing decking and pool surroundings to capture your personal style and stay current with trends. But the modern farmhouse look isn’t the only way for a poolscape to be memorable and special. Decking and the extended spaces around the pool set the mood, communicate style, and act as extensions of the home. So why not make them fabulous? Designing your decking and pool surroundings by theme is one way to capture your personal style and stay current with trends. “To me, it’s very, very important that we’re cohesive with all of our themes,” Kalamian says. For instance, when it comes to the modern farmhouse theme that Kalamian is working on for a client, the look is all about clean, contemporary lines, materials, and colors, with pops of interest. The project has eight-foot squares of concrete arranged in a diagonal pattern and separated by six-inch bands of grass in a design that goes right up to the pool’s coping. “It adds a lot of character to the space,” Kalamian says. When designing decking based on new styles, experts agree that it’s best not to be too trendy. “It’s always a good idea to stay as timeless as possible…so 25 years later it feels like it’s relevant to the look of the house and not dated,” Kalamian says. Guy Wood, president of Westside Watershapes in Fort Worth, Texas, agrees that home and decking should work in harmony. For instance, he’s working on a pool whose limestone decking is not only comfortable underfoot but echoes the limestone used on the house itself. The decking is also special because it appears seamless with the water’s surface, thanks to a knife edge and water that’s virtually flush with the deck. The result is a smooth, sleek, flat surface. “It’s more of a modern art piece,” Wood says. Beautiful patios and decking are also key to creating seamless transitions from a home’s interior to the pool area. Wood is working on one pool that incorporates 10-foot-tall glass doors that open like an accordion and collapse into the walls, creating a 30-foot opening. The same porcelain tile on the living room floor transitions smoothly outdoors to a nonslip variety. From there, limestone step pads, recessed into grass, lead to the limestone pool deck that matches the home’s veneer. “It’s just like the living room of the house and the outside all come together,” Wood says. Sarah Lograsso, director of marketing for Eldorado Stone in San Marcos, California, agrees that decking materials can make inside and outside melt into one. “We’ve seen a shift towards using decorative tiles to seamlessly connect indoor spaces to the outdoors,” she says. Pool decks are also perfect for delineating activity areas, such as conversation spaces, which are particularly hot right now. “From elegant lounge furniture to wide and colorful umbrellas, there are any number of accessories that can elevate a conversation space and stimulate connections between family and friends,” says Lograsso. Just as important as the design theme are a pool deck’s chosen materials, for reasons ranging from aesthetics to comfort to ease of care. In addition to being nearly maintenance free—just blow or sweep it, McIntosh says—it lasts for 10-15 years. Plus, it can be shaped and used to create designs, he explains. 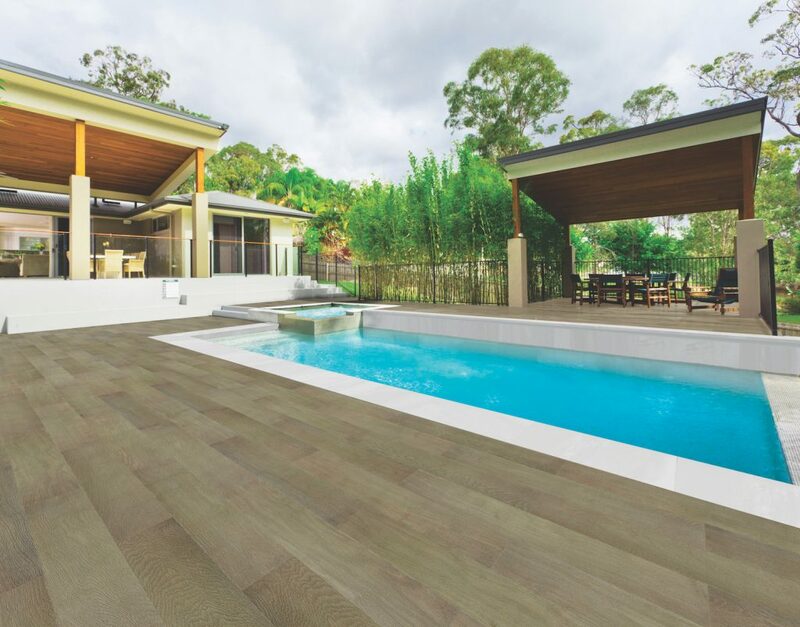 A popular choice for decking is porcelain tile that looks like wood, says Jared Becker, vice president of design and marketing for Los Angeles-based Walker Zanger. “That’s a cool new way to use porcelain tile,” he says. Another option is two-centimeter-thick porcelain tile, which Becker says is a recent technical innovation (thanks to the way it’s fired). Because of the thickness, it can be made to look like other products, like natural stone or limestone, and can be set in sand or gravel. It’s super durable too, says Becker. It won’t scratch or stain and is colorfast. One trend to watch is using digital printing technology on tile, such as creating the look of wood grain. “It’s a huge sector now for the interior of the home, but I think it’s just starting to realize its potential in the exterior as well,” says Becker. Stamped concrete, thanks to its flexible color and pattern options, is popular. Wood decking—available in many different variations and colors—is also popular, notes Lograsso. “Wood decking ranges from luxurious Brazilian wood to composite decking. Its long, clean lines create a contemporary pattern and incorporate a natural element for exterior spaces,” she says. “Trends continue to display an appeal for natural elements that work together effortlessly—wood and stone are opposing materials that perfectly balance each other,” Lograsso continues. 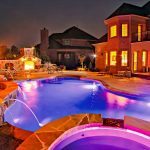 It all goes to show that whether you choose to go uber-natural with wood and stone or modern with knife-edge sleek, it’s fun for your pool to get all decked out.